The default way of copying items from the Windows command prompt is not the most effective option available. To copy items from the command line users need to right-click and select mark from the context menu. They then need to mark the commands and press Ctrl-v to copy them. That's a cumbersome process, especially if you copy and paste contents from the command line on a regular basis. Microsoft did however add an option to the command line preferences to make this whole operation more comfortable and natural. Open a command line prompt. you can either open one by pressing Windows-R, typing cmd and hitting enter, or by clicking on the start menu orb, then All Programs > Accessories > Command Prompt. Please note that the second option is valid for Windows 7, it may differ on other Windows operating systems. Once the command line is open right-click the title bar and select Properties from the context menu. A new window called Command Prompt Properties opens. Switch to the Options tab there and locate the entry Quick Edit Mode. It is disabled by default and can be activated by clicking on its checkbox. A click on OK closes the properties window and returns to the command prompt window. It is from that moment on possible to select items on the screen by left-clicking, just like it is done in any word processor. Items can be copied with the keyboard shortcut Ctrl-C.
Have a different way of copying and pasting from the Windows command prompt? Let me know in the comments. I’ve used this for awhile in XP. However, Ctrl-C to copy does not work. 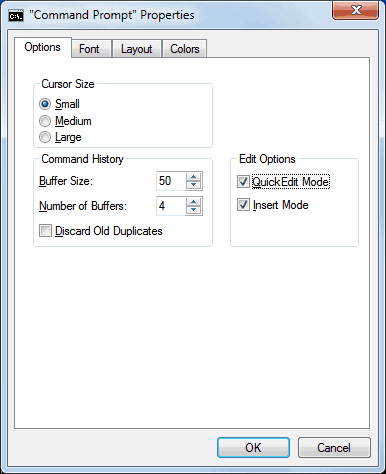 To mark in a command window left double click or hold down the left mouse button and drag the cursor. Once marked pressing Enter copies to the clipboard. Pressing the right mouse button is the same as typing the copied characters on the keyboard. Martin – please add a “follow this thread” or “subscribe to this thread” option without a comment — like we have with Tech Republic. Often there is very good input from your readers worth tracking on topics I don’t necessarily have anything worth adding personally. Subgenius, your wish is my command, added.